St. Louis Centre opened in 1985, but ideas for complete demolition and redevelopment of the five of the six blocks bound by Washington, Locust, Broadway and Eighth Street were presented more than a decade earlier. Although street-front retail was still bustling and vibrant compared to today, by the early 1970's planners and the powers that be considered these blocks to be "deteriorating and outmoded". 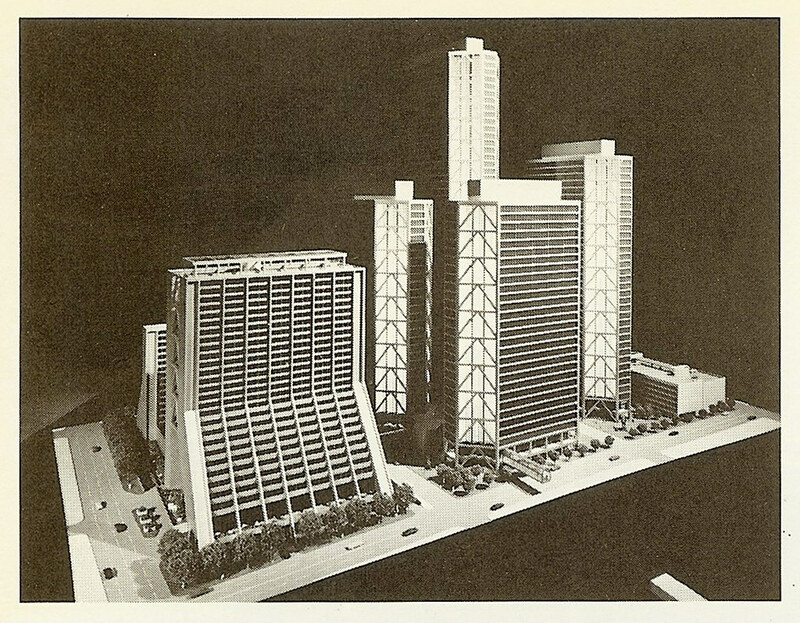 In October 1972 a partnership of the Mercantile Trust Company and Trammell Crow submitted to the City plan Commission a redevelopment proposal to be known as Mercantile Center. Mercantile Center would be composed of four office towers ranging in height from 24 to 51 stories, a hotel, a parking structure and an enclosed two level indoor shopping mall which would be connected to the existing Stix Baer & Fuller and Famous Barr department stores by sky bridges as well as to the new towers. The towers would have contained 3.3 million square feet of office space and 1,000 hotel rooms. 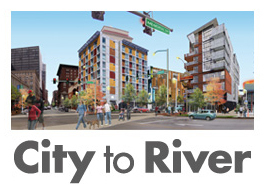 The combined retail center consisting of the existing department stores and the new mall would contain 1.8 million square feet of retail space, making it the largest shopping center in the St. Louis region. 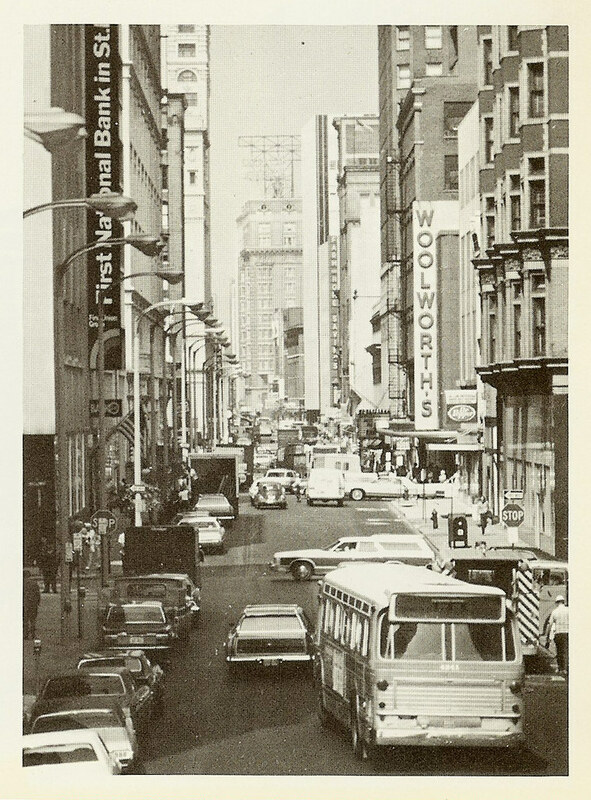 Locust Street looking west from Broadway in 1974. The Mercantile Center redevelopment proposal was accepted by the Plan Commission in February 1973 and recommended for approval by the Board of Aldermen and the Mayor. 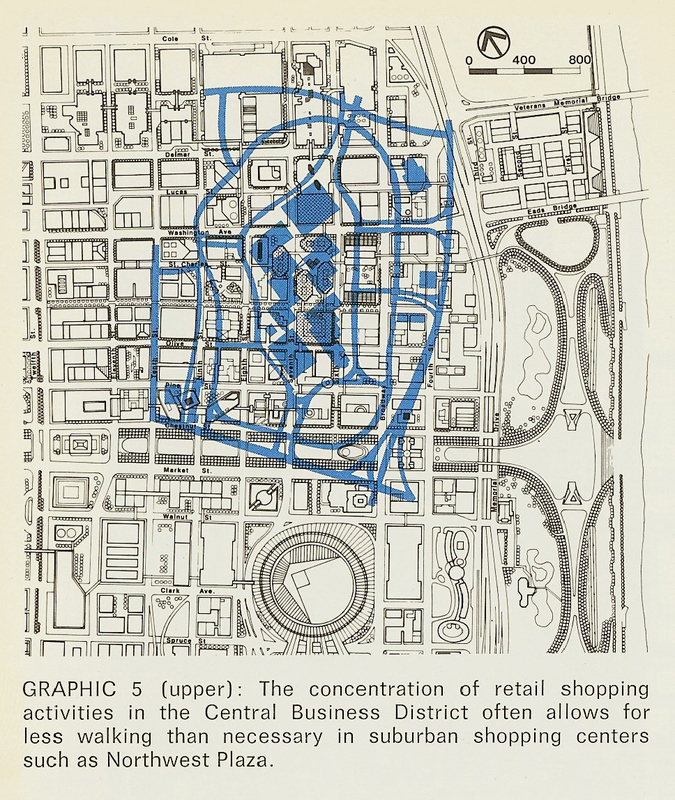 The 1974 Plan of Downtown St. Louis by the City Plan Commission included Mercantile Center as a key component of its recommendations for the Downtown Core District. 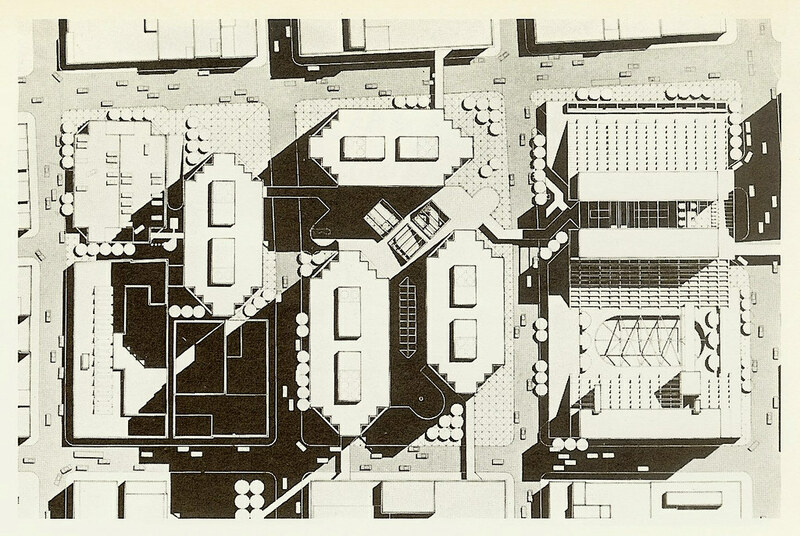 Ironically, one of the recommendations for the Core District included in the 1974 Plan was to "discourage demolition of existing buildings suitable for rehabilitation" even though the same plan recommended the Mercantile Center redevelopment which would completely level five of the six blocks within the redevelopment boundaries. Unlike the nearly block-wide bridges that would eventually obliterate Washington Avenue and Locust Street, the sky bridges envisioned in Mercantile Center would have been narrow tubes like those that connected St. Louis Centre. 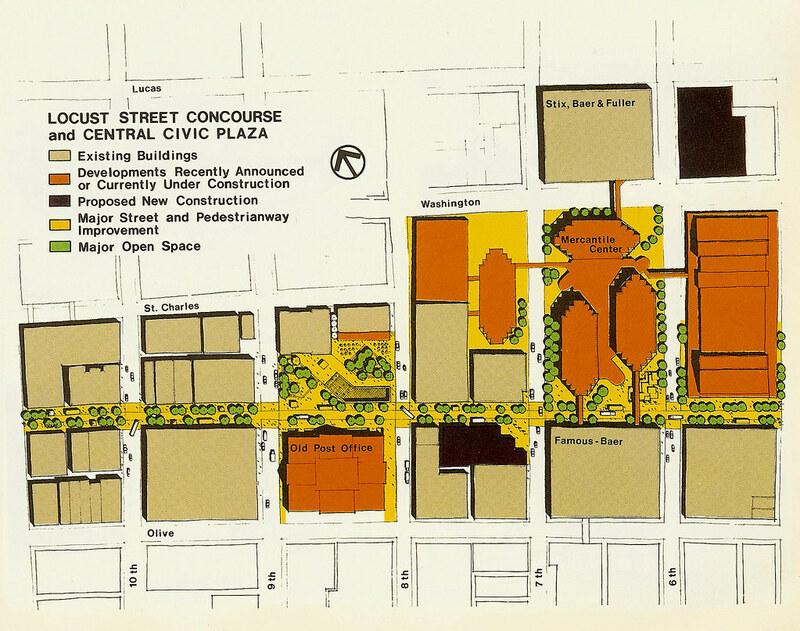 The 1974 Plan for Downtown envisioned a network of sky bridges throughout the CBD including linking Mercantile Center north to the Cervantes Convention Center, which at that time fronted on Convention plaza. It is important to note that the Mercantile Center Redevelopment did not include acquisition or demolition of the Ambassador Theater Building located at the northwest corner of 7th and Locust Streets during any phase of the project. In 1995 Mercantile Bank demolished the Ambassador in order to create a circle driveway on the south side of the Mercantile Tower. 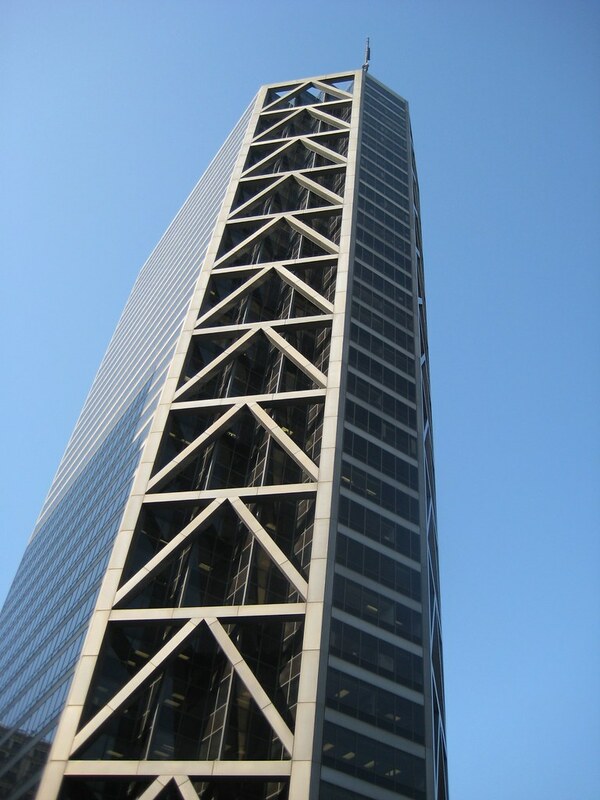 The Mercantile Tower, which opened in 1975 (now known as US Bank Plaza), and an adjacent parking structure were the only portions of Mercantile Center that were completed. The failure to complete Mercantile Center would not however be the end of the dream of an indoor shopping mall in Downtown St. Louis. Wow, those pictures are incredible. Many would say that downtown St. Louis of the '70s was the low point in the city's history, but clearly the streets and sidewalks were A LOT more vibrant back then. I can't believe how DEAD downtown streets are today, even at supposed "rush" hours. It's also important to note that the Ambassador Building was demolished for a driveway that is permanently blocked off-- it is completely useless and lifeless. WHY??????? Arrgh, that stupid plaza north of the old post office certainly has an old pedigree, doesn't it? Like gasm said, I'd give anything to have the street life of the 70s today. 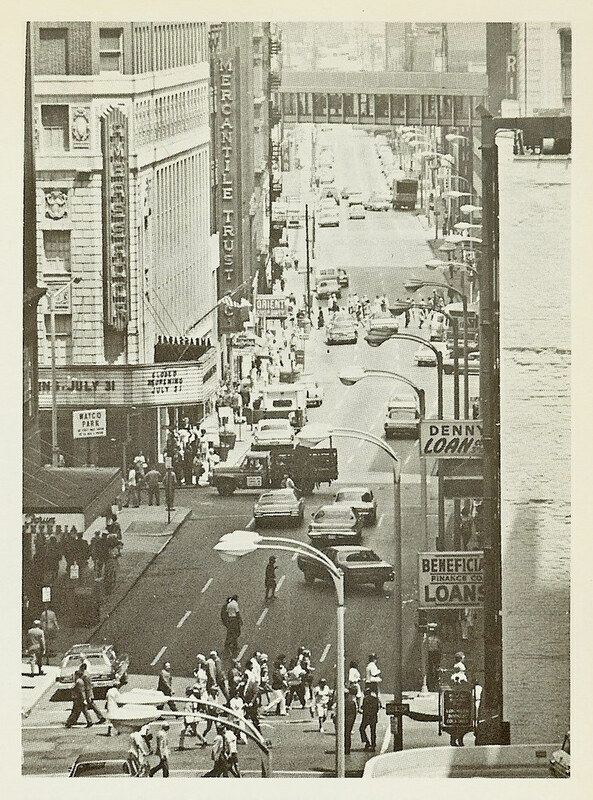 The Locust street depicted in the photo from 1974 at the top is almost entirely unrecognizable. I walk Locust quite often, and I will often not encounter a soul from Broadway until I get to the Culinaria. Future of the Admiral could be up in the air.